Atlanta's 230 neighborhoods are grouped into 24 neighborhood planning units. The NPU system was established in 1974 by city ordinance to assure communication between the city and its citizens. NPUs transmit information from city bureaus and departments and provide citizens with a way to participate in city planning. The NPUs review and respond to proposals about all kinds of city functions: transportation, parks, recreation, economic development, public safety, human services and environmental protection. The NPU process gives the city a sounding board for citizen reaction. It also allows citizens to initiate ideas. 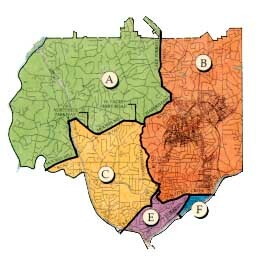 City Councilman Howard Shook has a new Web page full of Buckhead issues and contact numbers. To check it out, click here.